Loved the food here – hope something similar to this opens up in India. 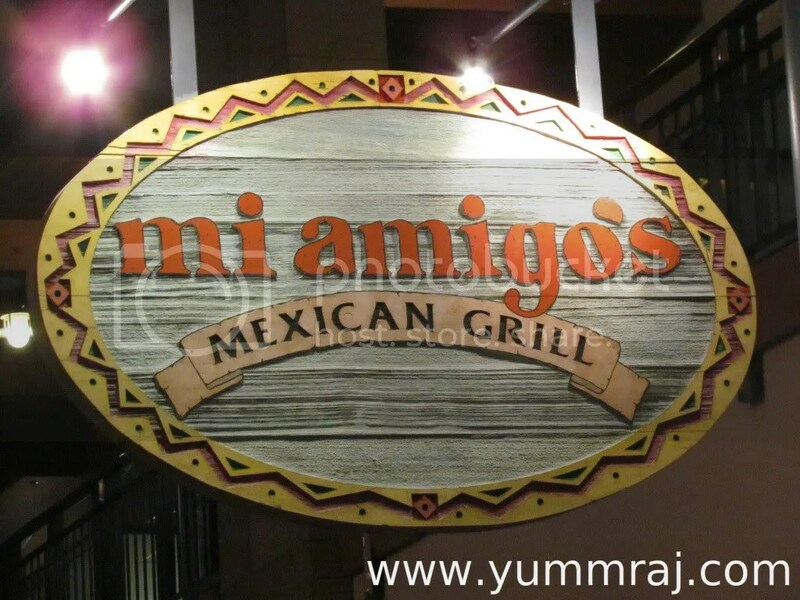 This post is an Indian Foodie’s perspective on Mexican food in Phoenix, Arizona, USA. He has never been to Mexico though. 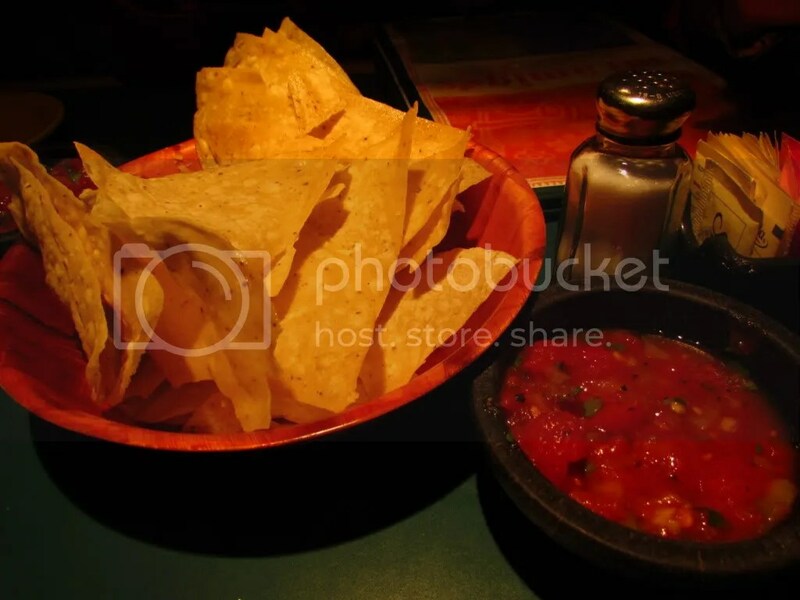 The comments are purely based on the taste & not on authenticity / proximity to the traditional Mexican taste. 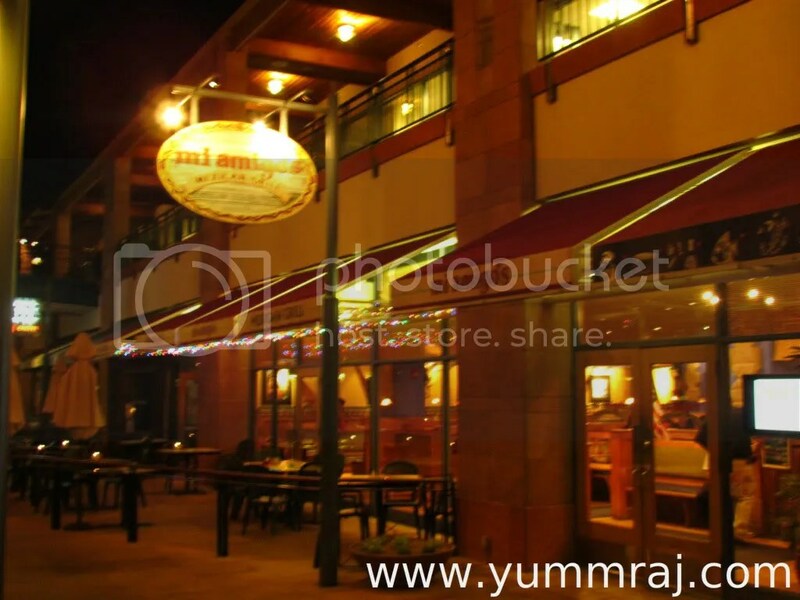 The Restaurant is in a building that has many eateries. I cud not figure out why but this place attracted me & we just walked in. The ambience was good – predominantly dimlighting with lamps on each table. Njoyable peppy (I guess) Mexican Music was being played in the backdrop. After reading the menu card twice we figured that we had not figured anything at all. So time to seek help. We asked the lady serving us. She patiently explained the names, the meanings & at times the ingredients as well. She suggested some dishes & drinks as well. Full marks to her patience , product knowledge & role as a hostess. The food was good & we loved it so much that we revisited the place in just 3-4 days. As we sat waiting for the food, we were served inhouse made super crispy super thin & very tasty nachos with unimpressive looking but outstanding salsa. The salsa looked a bit watery (not thick) but its taste was too good. Once we started eating this, the hands were just going to the mouth & back to the plate inspite of repeated signals from the brain to stop doin that!!!! We finished a full load of nachos & salsa. 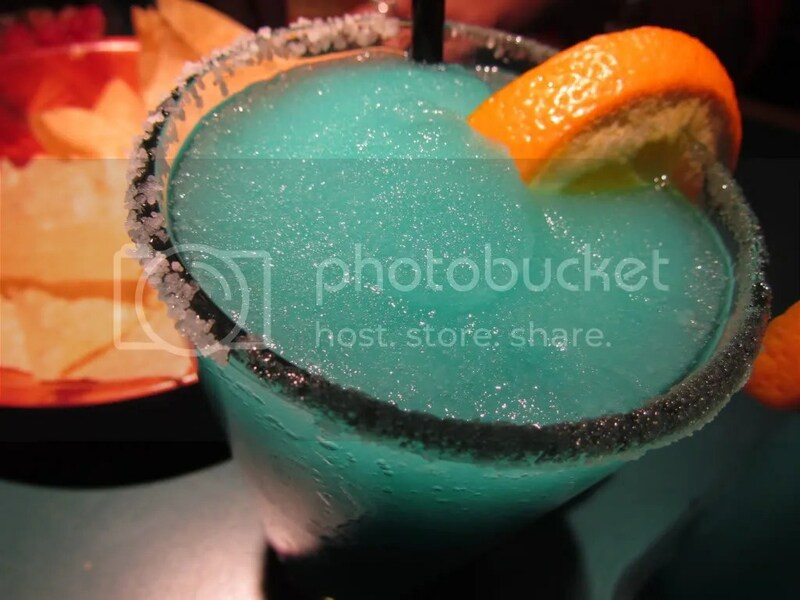 As suggested by the lady serving us, we went for Mi Amigo’s signature Margarita served ‘frozen’ with a splash of citrus tinged Blue curacao……….I added a bit of sweet & salt. Too good. Refreshing longggggggggggggggggg drink. 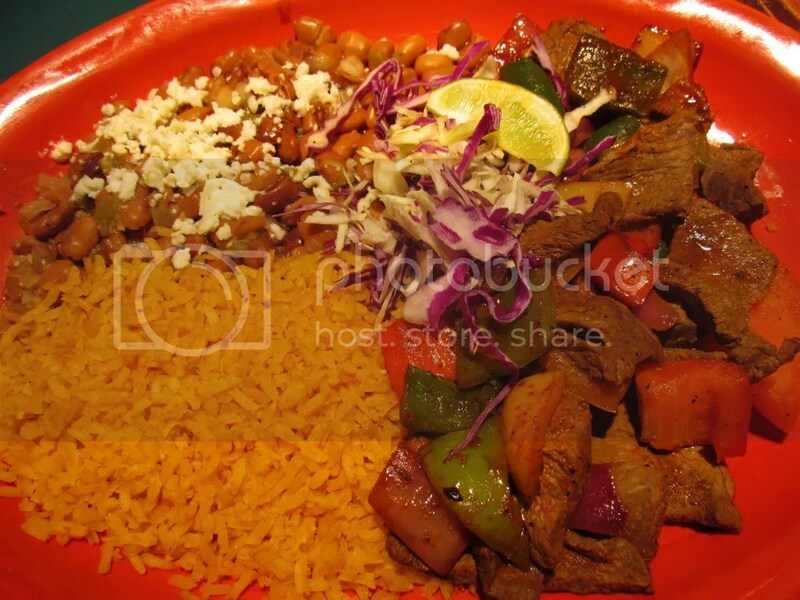 Picado de Valentin – The menu card read ‘Steak marinated in bitter orange & a blend of spices, then grilled along with bell peppers & onions’. When served, this turned out not to be a steak in the traditional way buy small bite size pieces of grilled beef. The salt levels were low by Indian standards but ok by American standards. The meat was not juicy, a slight bit chewy but good to taste & cool flavors. This ‘steak’ was served with an outstanding taste & flavored super soft ‘Mexican tomato rice’. These were full independent grains of rice, super soft & infused with an interesting tomato salsa flavor. Loved the rice. It tasted much better than what I expected by the looks of it. 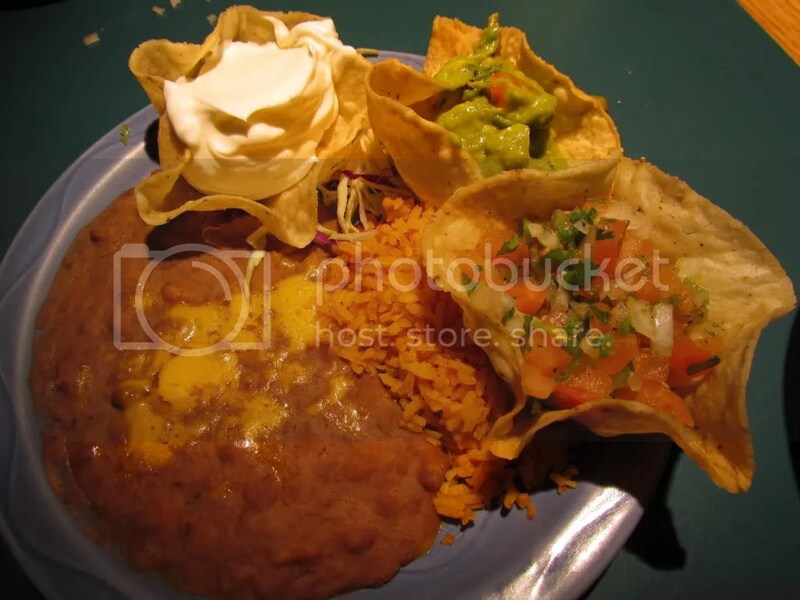 Also served in this combo was pinto beans with cheese. This tasted good but not great. ‘Seasonal Grilled Fish’ said the menu – It was outstanding – soft, juicy, tasty, full of flavors, perfectly cooked. Turned out to be Tilapia!!!! 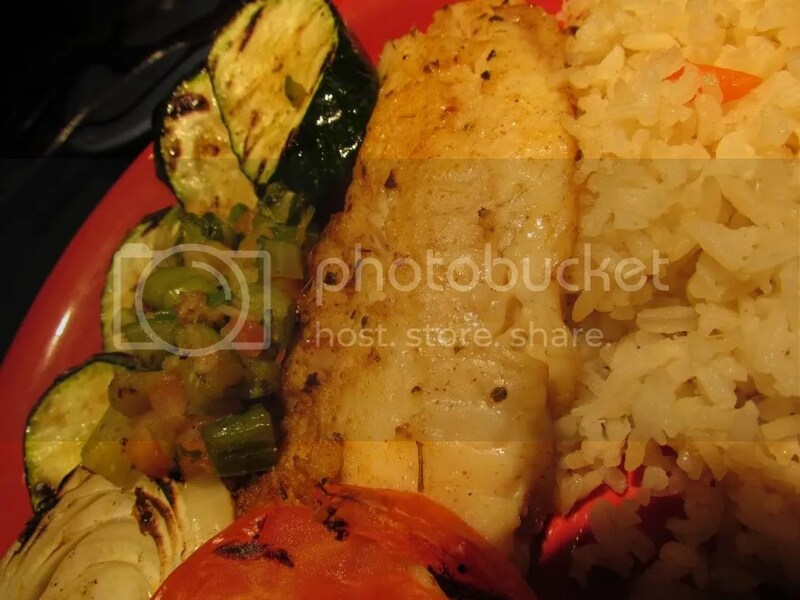 The fish was served with grilled Zucchinis, white onions & miscellaneous veggies & an outstanding buttered rice. 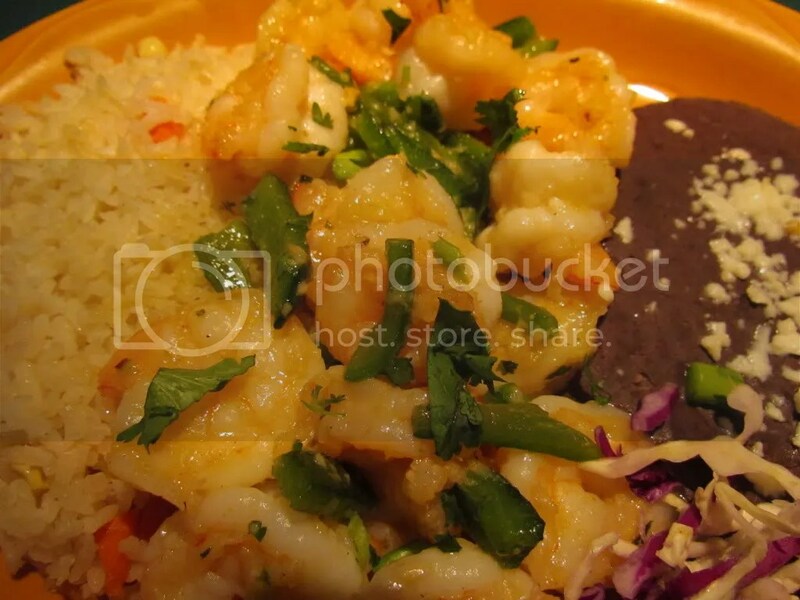 We also tried lipsmacking ‘Shrimp & Garlic platter’ – Shrimps sauteed in Garlic butter, with diced poblano chillies. The shimps were as soft & juicy as they cud – burst out with flavors with every bite. This was served with refried black beans & super soft & tasty white fried rice. For the uninitiated, refied black beans are similar to rajma (kidney beans) cooked in beef stock, made into a paste. The refried black beans had a robust & njoyable taste. 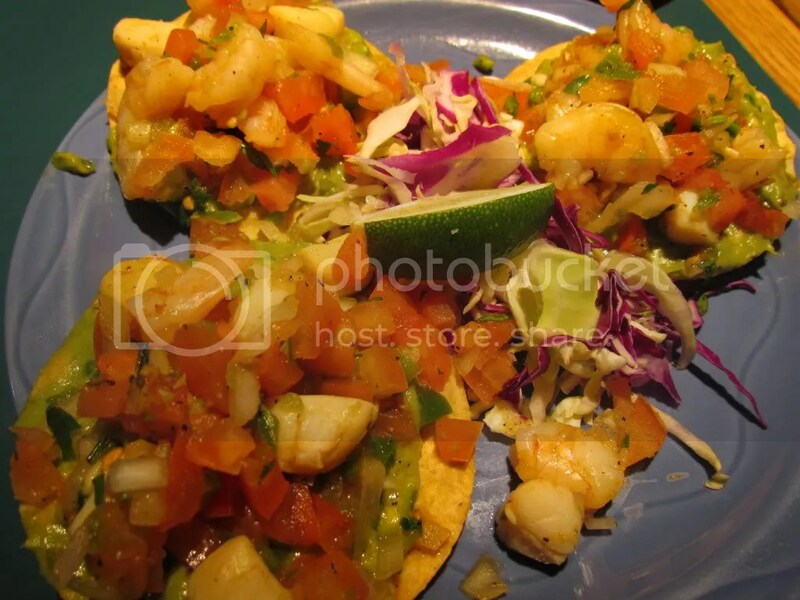 Seafood toscadas – wow. These were 3 munchy mini toscadas loaded with shrimp & scallop ceviches, on a bed of Guacamole. Really smart to taste. The toscadas were crispy & tasty. The topping was cool & shrimp & scallop pieces were softttttttt & good. 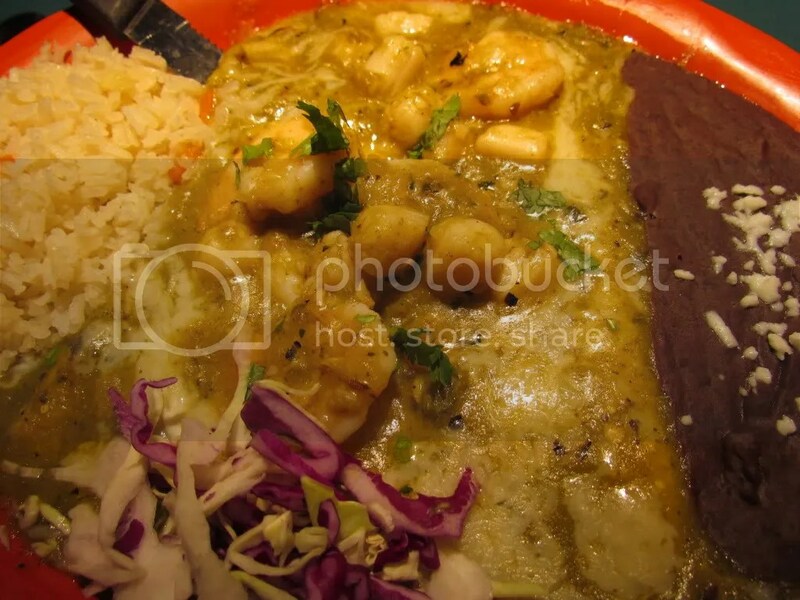 Shrimp & Scallop Enchiladas – This was too cheesy for what Indians in general r used to but ok as per American standards. I removed the excess cheese & ate – it was good. Served with tasty Refried black beans & soft & nice white rice. I tasted Pure veggie tacos from my veggie friend. It was better than any taco I have had in India. It came with with very good dips. My friend also enjoyed a veggie version of the enchiladas. 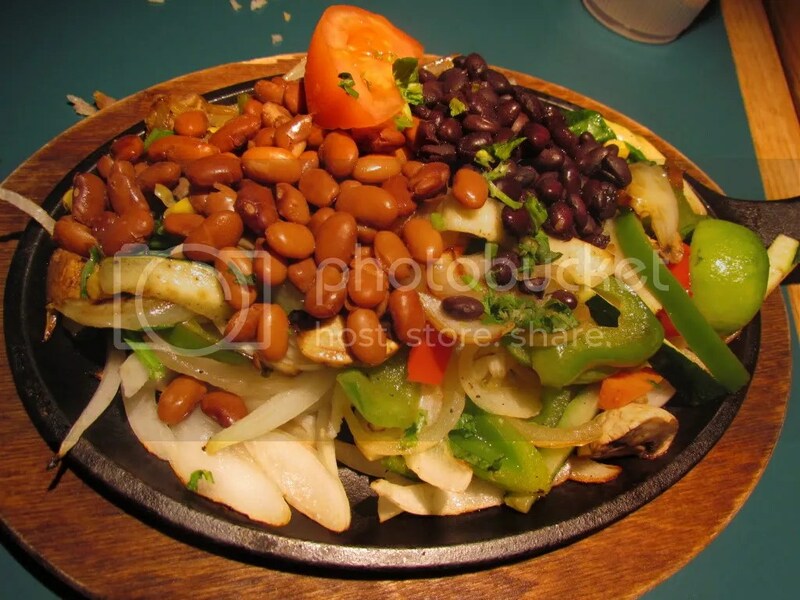 In his case the refried black beans was not used, Instead he was served boiled beans sauteed. He liked it. I liked it as well but of course not more than my seafood version. Overall, loved this place. I am just hoping that they open up few restaurants in India / someone opens up similar restaurants in India. We r seriously lacking good Mexican food places in India.